$60 initial daily benefit at 4+ ADL deficiencies or cognitive impairment. The amounts are chosen to discourage beneficiaries from claiming a higher level of disability than is warranted. After the first year of an individual’s enrollment, the daily benefit will increase according to the increase in the Consumer Price Index for Urban Consumers (CPI-U, or simply CPI). This is more generous than the required benefit increase in the statute. One potential interpretation of the statutory language is that the increase in the benefit amount begins only when a beneficiary receiving benefits (that is, everyone who claims starts with a $50 daily benefit). Another potential interpretation is that the increase in the benefit amount starts from the 6th year of the CLASS Program. Note that increases in long-term care service costs have been historically higher than the CPI33. While this proposed benefit indexing method may not cover future inflation increases fully, it does help to keep the premiums affordable. In addition to the ADL and cognitive impairment triggers, the Secretary is authorized to define another similar benefit eligibility trigger34. A possible third trigger would be one for mental illness. We believe the cognitive trigger already accommodates beneficiaries with mental retardation and some people with intellectual disability. As well, there is no established test similar to the standardized test for cognitive impairment. A standardized test with sufficient experience data is a highly desirable for estimating claim incidence rates in an insurance setting. Adding this third trigger at this time will make the CLASS Benefit Plan more expensive and increase the likelihood of inadequate premiums for the Program. If the Program shows favorable results, we should revisit this issue. According to the statute, benefits are “not subject to any lifetime or aggregate limit.”35 As private insurance has painfully learned, because beneficiaries have no incentive to preserve their benefits when there is no lifetime limit, unlimited benefit plans are expensive and risky. Most policies with lifetime benefits had significantly unfavorable experience. Premiums for lifetime benefits can be more than 50% higher than the corresponding premiums for a limited benefit period plan. The vast majority of group long-term care insurance policies today have a limited benefit period. Our recommendation is to satisfy that statute by paying 100% of the daily benefit for the first five years and then only 20% thereafter, without limiting the aggregate amount of duration. This feature is intended to meet the requirements in the statute, keep CLASS premiums reasonably close to that for private insurance, and minimize one potential source for claim variability. With regard to the form of benefits for the eligibility beneficiaries, the statute states the following (emphasis added): “Cash benefits paid into a Life Independence Account of an eligible beneficiary shall be used to purchase nonmedical services and supports that the beneficiary needs to maintain his or her independence at home or in another residential setting of their choice in the community…”36. Accordingly, we question whether payments of straight cash are required. Instead, cash equivalents in individual accounts could be used to purchase services and supports for the beneficiaries. The provisions of the statute appear to grant a great degree of autonomy to the beneficiaries on the choice and specifics of the services and supports. We are not opposed to paying cash when it is appropriate. We believe it is difficult to determine whether it is appropriate or not. Sound insurance systems require a demonstration of a real loss. With cash payments as benefits without limitations, the enrollees are incented to claim whether there is a real loss or not. Unfortunately, we believe the statute gives conflicting messages regarding benefits. On one hand, it appears to limit the usage of the benefits. One the other hand, it appears to suggest cash payments without accounting for its use. We utilized some of the learning from Cash and Counseling demonstration projects in the following proposed benefit structure. A counselor will be assigned to provide advice and assistance in planning of services and support, in particular, assistance in developing a plan of care. The cost of counseling will be part of claim administrative expenses and will not reduce the benefit amounts. Funds will be deposited into an individual account (the Life Independence Account) of the beneficiary on a weekly basis. Under the plan of care and the advice of the counselor, the beneficiary can direct available funds in the account to obtain the services and supports needed as long as they are not on a list of exclusions. This list would include items such as food, rent, liquor and luxury items. Within guidelines set by the CLASS Office, the counselor can make exceptions to the list. Associated with the account, the beneficiary will receive a debit card with which permissible services and supports can be purchased. Cash could not be withdrawn from the account via the debit card. The CLASS Office will establish a process to train, monitor and evaluate the performance of the counselors. If beneficiaries need direct-paid care services (for example, unlicensed home health aide), they must use a fiscal manager to handle various employment and reporting requirements. The expenses associated with the fiscal manager will be deducted from the account balance. Specific activities and time spent by the paid direct care worker (including paid family members) must be fully documented. Our goal is to strike a balance between beneficiary-directed benefits and the potential for induced demand from the perception of a free-flow of cash. According to the statute, “nothing in this title shall be construed as prohibiting benefits paid under the CLASS Independence Benefit Plan from being used to compensate a family caregiver…”37 We remain concerned regarding unwarranted payments to family members, in particular, the spouse. It is difficult to differentiate spouse’s free time from the time spent that needs to be compensated. Moreover, payments to a spouse are effectively cash to the beneficiaries. We are considering a reduced payment amount to a spouse (for example, $10 daily). Regardless of our concerns, the proposed benefit structure is a significant departure from typical long-term care insurance benefits and should be viewed as an attractive feature of the CLASS plan. Long-term care insurance claim patterns are typically characterized by very few claims in the early years of a program and a significantly higher number of claims in the later years. Level premiums develop a relatively high fund balance in the early years when premiums exceed claims and expenses. This relationship reverses in later years. Increasing premiums make the initial premiums lower than the corresponding level premiums. This may result in higher enrollments. This, in turn, increases the spread of risk and improves the chance for program sustainability. An increasing premium plan provides less inflow to the trust fund in the early years than a level premium plan. The Program is subjected to less investment risk in matching the cash flow from assets with the cash flow from claim and expense obligations. Lower cash inflow also places less reliance on the expected relatively moderate fund returns available to the CLASS Program which is limited to an investment portfolio of Treasury Securities. As increasing premium schedules are still uncommon in private insurance, they could give the CLASS Program a temporary competitive advantage. From the enrollees’ perspective, an increasing premium schedule starts out significantly lower than the corresponding level premium but eventually exceeds it in later years. Lower initial premiums mean more efficient use of enrollees’ discretionary dollars. Premiums go up relatively in line with increases in plan benefits and general wages. Also, if enrollees decide to lapse, their cumulative outlays would be less than their cumulative outlays for level premiums for the same period of coverage. However, a potential disadvantage of an increasing premium schedule is that enrollees may not be able to afford the premiums in their later years when the enrollees’ income is relatively fixed. This can be addressed by exempting enrollees from scheduled premium increases after a certain age or period of enrollment. One method of implementing an increasing premium schedule is to index the premium by the CPI in the same manner as the daily benefit amount increases by the index. This has the undesirable feature of ever-increasing premiums beyond the retirement years. Also, there will be uncertainty each year regarding the amounts of future increases. We propose an increasing premium schedule with a 4% compounded annual increase that stops at age 70 (or after 5 years of enrollment, whichever is later). Premiums are level thereafter38. The 4% is chosen to provide an attractive entry price point to most enrollees. Other increasing premium schedules, such as indexing up to a specific age, are also under consideration. After enrollment, if an enrollee finds the increasing premium schedule unaffordable, the enrollee will have the option to freeze future premium increases with a corresponding freeze in benefits. However, if premiums need to increase for other reasons (not related to the set annual increase), enrollees who have frozen their premiums will still be subject to those increases. Waiver of premiums during the time a beneficiary is receiving benefits is not a statutory requirement but is common in private long-term care insurance. To be competitive, the CLASS plan should also include this feature, except when the Limited Initial Benefit provision applies. Premium discount for spouse coverage is also common in private insurance in recognition that couples tend to have lower claim costs than singles. However, we believe that premiums can only vary by the age at enrollment in CLASS. A response to the premium discount would be to allow a couple to share their benefits. If a spouse is a beneficiary for more than 5 years, the benefit amounts would not be reduced (that is, to 20%) to the extent that the other spouse’s 5 year period has not been used up. Certain group and most individual long-term care insurance plans have preferred risk discounts. We believe the CLASS Program has no apparent answer to this feature. Under the statute, eligible beneficiaries must meet a minimum earnings requirement for 3 out of the first 5 years of enrollment equal to the amount of wages to be credited with one quarter of Social Security coverage41. This amount is $1,120 for 2011. However, the Secretary is authorized to make exceptions to this rule for certain population42. A low minimum earnings requirement allows enrollment of low-income workers who, as a group, are generally in poorer health43. Furthermore, the statute requires a $5 nominal monthly premium for enrollees whose income is below the poverty line or who are full-time students under age 2244. This provision poses a potential threat to the financial viability of the CLASS Program. Without any mitigation for adverse selection, this is a tremendous incentive for a poor worker, who is near or already met the benefit triggers, to enroll. The ‘returns’ in the form of benefits (approximately $18,000 a year for the first year and indexed higher thereafter) far exceed the ‘investments’ of 5 years of $5 monthly premiums ($300). Because other enrollees will be subsidizing the poor, the overall premiums will need to be higher than without this subsidy. This adds to the competitive issue with private insurance. In addition, estimation of the appropriate premiums will not be reliable due to the unpredictable mix of nominal and regular premiums. In order to mitigate this threat, raising the minimum earnings requirement for certain enrollees so that it is always above the poverty level could be explored. This should be somewhat effective in controlling adverse selection by those who expect to receive a high level of benefits for very little premium. As stated above, the Secretary is authorized to promulgate regulations on exceptions to the minimum earnings requirement for certain populations. 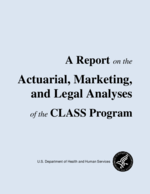 Under the Phased Enrollment plan design, those enrolled through individual enrollment are certainly a population that needs special attention since most of the adverse selection is expected to come from this group. Under the Temporary Exclusion design, the potential problem is less severe but not entirely eliminated. In either case, raising the minimum earnings requirement on this group would help. In addition, since it is not explicitly prohibited, defining “actively employed” to require a minimum number of work hours at time of enrollment can also help mitigate adverse selection. Finally, there should be a specific regulation to prevent companies from forming for the sole purpose of enrolling employees into the CLASS Program.